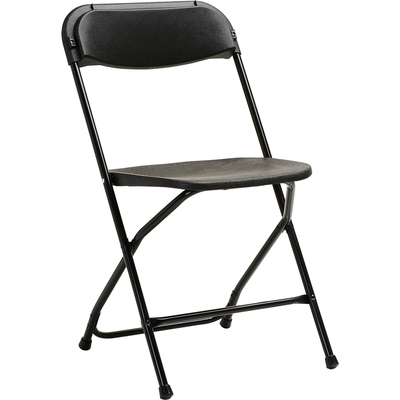 Folding Chair Features A Deep Radius, Contoured Back For Enjoyable Seating Comfort. Powder-Coat Finish Resists Scratches And Wear To Keep Its Professional Appearance Through Daily Use. Double-Riveted, Cross-Brace On The Rear Legs Helps Stabilize The Chair On Most Surfaces For Safe Use. Nonmarring Leg Caps Protect Your Floors From Scuffs And Scratches To Keep Them In Excellent Condition. Stackable Design Can Be Stacked Up To 60 Chairs High For Easy Transportation And Storage. 20-Gauge, Tempered Steel Frame Supports Up To 300 Lb..
Folding Chair Features A Deep Radius, Contoured Back For Enjoyable Seating Comfort. Powder-Coat Finish Resists Scratches And Wear To Keep Its Professional Appearance Through Daily Use. Double-Riveted, Cross-Brace On The Rear Legs Helps Stabilize The Chair On Most Surfaces For Safe Use. Nonmarring Leg Caps Protect Your Floors From Scuffs And Scratches To Keep Them In Excellent Condition. Stackable Design Can Be Stacked Up To 60 Chairs High For Easy Transportation And Storage. 20-Gauge, Tempered Steel Frame Supports Up To 300 Lb.